I rode with my wife to her work yesterday 480 miles round trip. An hour of diag, led to no spark.......which led to only 2.8v and flakey at that power to converter and ICM. That connection could have broken anyplace in my ride yesterday leaving me stranded with the closest recover person more then 600 miles away. The connection waited till I was in the shop parking lot to break completely..
Last edited by E.Marquez; 05-08-2018 at 03:29 PM. Weirdest thing I've seen with wiring. Almost like it wicked up the wire. Yes, and that's what it did...... I have used this wire supplier a lot, and I got concerned. Went and cut into 4 wiring jobs done with this wire, no issues, none.. just this one on my bike. Wow. 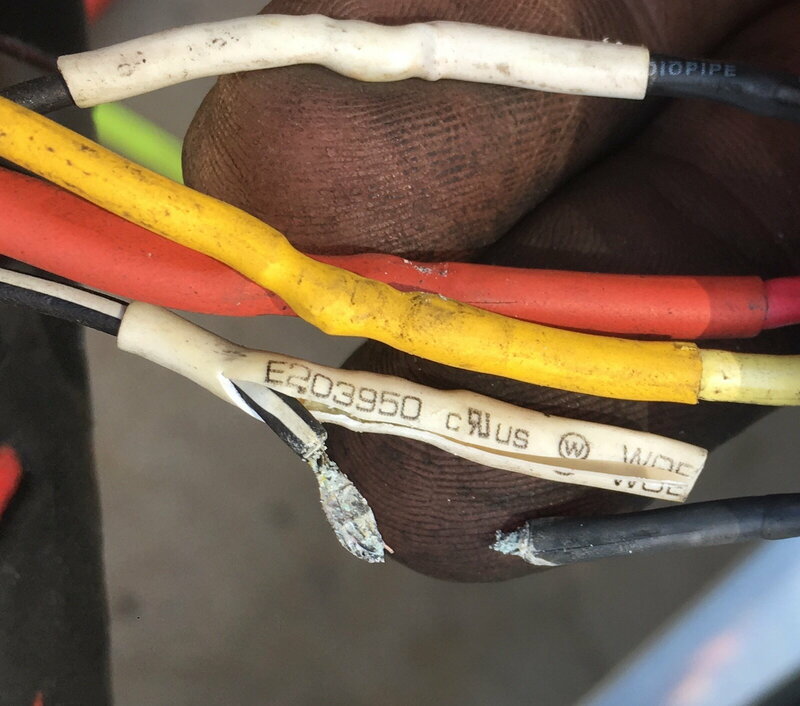 I've seen battery corrosion travel through wires. Guess this is just corrosion/oxidation? Do you use the heat shrink that has glue on the inside? I do a metric **** ton of fender eliminators/tag lights/AM turn signals and feel like it's creating a water tight seal. Most times I double shrink, one on the individual and a larger on the pair. 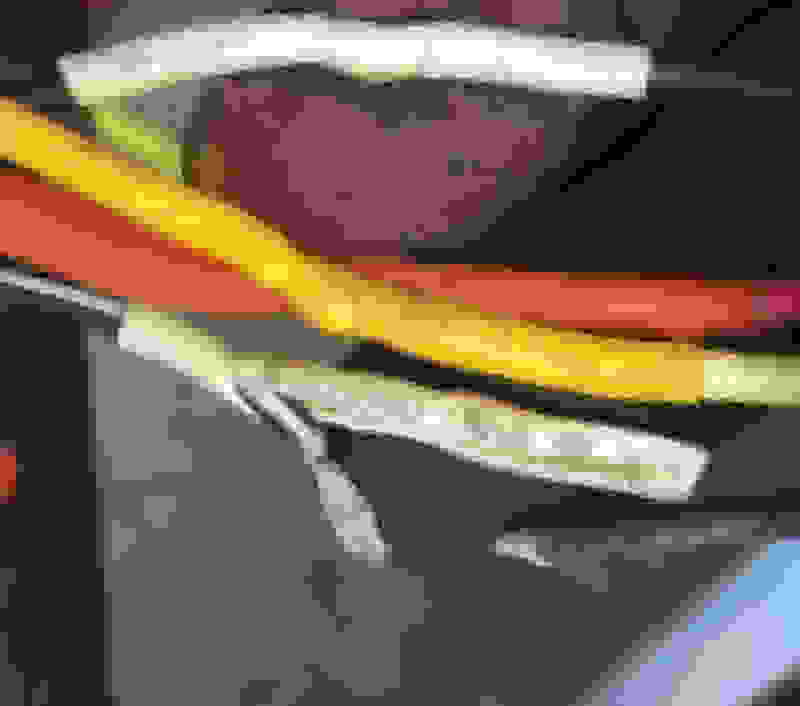 The two wires in that picture were TRIPPLE shrinked... Adhesive lined tube over each wire, adhesive lined tube over a pair of wires, non adhesive lined tube over a group of wires. It seems water entered from the lower end of all that and was pushed up..the low end was in the air stream under the headlight.. Do water and rain at speeds up to 100 MPH at times and commonly at 75-80 and all that not including a head wind. Must not have gotten a good 360 seal on the individual wire tubing. Ahem.... Its the wire your using... I learned something new in my investigation to buy a harness for my car. 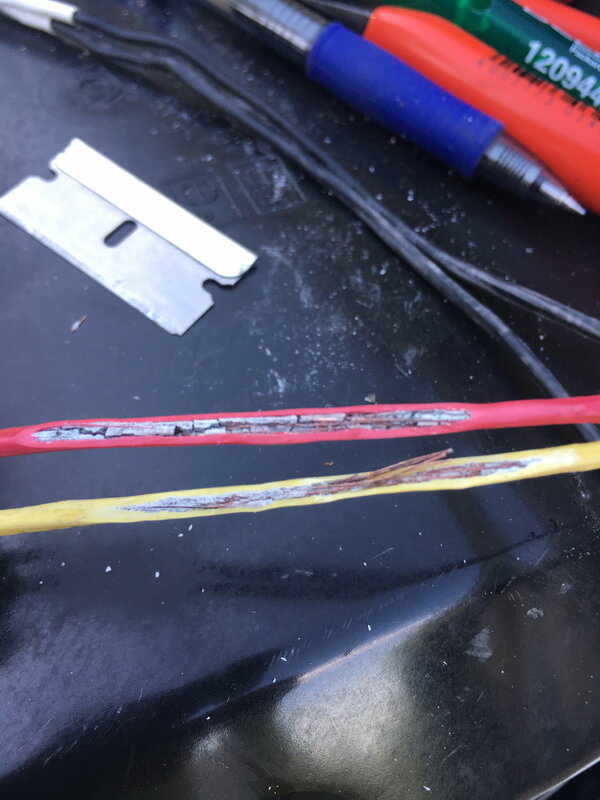 Also unfortunately the type of shrink you use and oh a little butyl for wire connections goes far. For wires I suggest nickle plated TPFE coated wire. Stuffs expensive as hell but honestly worth it. The copper ones especially aftermarket all creep like that a big pain in the *****. For shrinking I highly reccomend butyl and high grade shrinks with lots of glue. IT should go Solder-butyl-shrink-butly-shrink-tape... Skip the tape..
That is how I do my car after doing 4gLTE instilations on cell towers which experience wicked wicked rain and wind and after farting around on marine connections... Actually on marine stuff I tell you what if I didn't pack it like that I just left the connections open and left extra wire to chop back and splice in. Want to talk about corrosion. The ocean is mean. But enough rambeling. I clicked on the thread because it said the VTR never let you down and I feel the same way for mine. I hope my advice keeps your wires from failing. EDIT: Yes the it will look like a big lump but itll be sealed. I also forgot to mention the first 3 steps are for 1 wire then the last three are for a group. If that leaks.... Ill just quit working on cars. Last edited by RedStormJ; 05-31-2018 at 09:32 PM. Reason: Humor.